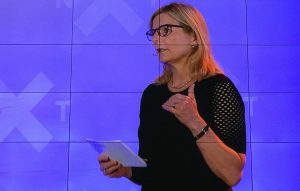 PfC’s founder and chair Ingrid Stange challenges the business leaders Liv Freihouw, Kristin Skogen Lund and Vibeke Hammer Madsen on how to impact the future. Go from “do no harm to” do good “. DNB NXT is Norway’s largest meeting place for investors and entrepreneurs. Under the headline Impact & Innovation – How to impact the future, PfC’s founder and chair, Ingrid Stange, is in the panel together with Liv Freihouw, Director of Enterprise Policy, ICT Norway, Kristin Skogen Lund, President NHO, Vibeke Hammer Madsen, CEO, Virke and Marte Gerhardsen , general manager, Tankesmien Agenda. Together with Gerhardsen, Stange challenges business leaders on how they can contribute more to economic, sustainable and social development. Ingrid Stange on stage during DNB NXT 2017. 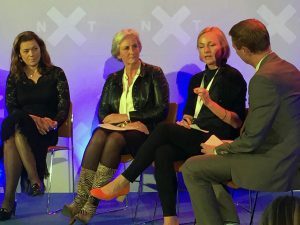 I have been asked to challenge the business community – here represented by Kristin Skogen Lund, Vibeke Hammer Madsen and Liv Freihouw – on impacting the future. Please allow me to just very briefly celebrate the fact that we happen to be a 100 percent female group here. This was definitely not the case when I entered business as a young MBA graduate in the late 70-s and early 80-s. With today´s challenges and opportunities, the role of the business community is more crucial than ever, and diversity – in all forms – is a prerequisite to understand and to meet the future in a proactive and constructive manner. Politics – in best cases – is based on compromises and the art of the possible in negotiations. Compromises – by nature – are seldom edgy and innovative. Whereas, to survive and excel in business you have to lead, to be proactive and innovative. So – I am afraid we have to lean on business to ensure a sustainable future. When it comes to technological innovation I trust the market forces to give business the challenges needed. On the other hand – When it comes to social innovation – the market is not yet a strong enough challenging force. Are you making sure your company – as well as you, yourself as an individual – actively work to ensure we are reaching the global goals – known as the UN Sustainable Development Goals? But – then you say: How can I, as a small entrepreneur play a role? I have my hands full running my business. Or – as a leader of a large company – I have to secure my employees´ jobs. There is tough competition out there. Kristin Skogen Lund, Vibeke Hammer Madsen and Liv Freihouw. Exactly – this is why you have the power and obligation to work towards the global goals – because if we don´t reach them, there may be no business. As we all know – there is no business on a dead planet. Put on your Sustainable Development Goal-lens, and make a thorough strategic process with and within your organisation. Go through your entire value chain, and define 1) how to avoid doing harm, and 2) how to actively do good. Do you know your supply chain and its effects on the climate, labour conditions, gender issues, etc. Can you improve anything here? How can you actively create more education, less poverty, increase gender diversity etc. How are your production conditions with regards to the SDGS? Are your products and services compliant? In Partnership for Change we invest in women and youth to help develop skills, create jobs, and build economic independence. We partner with local social entrepreneurs in the global south. And – we partner with business companies in Norway to create business opportunities for these social entrepreneurs. Mester Grønn is an example. Together we now build a pilot for large scale basket production in Ethiopia. This creates a win-win situation. Mester Grønn builds business and the local social entrepreneur builds business, creates jobs and develops skills. Our main partner in PfC is Formuesforvaltning. By supporting our operations both with generous funding and in kind support, Formuesforvaltning builds pride in the organisation, attracting proactive young employees who seek socially aware employers. Also – there is an educational element for the employees, who are able to follow our work closely, thus internalising issues that would otherwise have been distant to them, making them more interesting discussion partners for potential clients. I also wear a Montessori hat: The Montessori school I run is now constructing the most environmentally friendly school in Norway – and maybe Europe. We use a concept developed by Snøhetta, Skanska and Zero – called Power House. This building is part of a larger strategy – Montessori2030 – building in the global goals in our entire operations. This has created an new enthusiasm among our employees – we are back at the entrepreneurial days. The process has caught interest in the global Montessori community. A small, social business is thereby able to make a large contribution, through state-of-the-art practice inspiring others to follow. This is not a question of CSR or handouts. It is a question of being part of the solution – and a decent human being.